Pokémon GO Volbeat and Pokémon GO Illumise are both bug type Pokémon. LThese Pokémon are completely different in appearance when it comes to genders, which makes it easy to distinguish the male (Volbeat) to the female (Illumise). Volbeat is region exclusive to Europe, Asia and Oceania. Illumise is region exclusive to Americas and Africa. Both Volbeat and Illumise have identical CP and stats. Volbeat Max CP is same as Illumise Max CP: 1620. They have a weak ATK (143) which would not make them useful in taking down defenders and getting gyms. They have a low STA (130) and average DEF (171), still not making them ideal to placed in gyms. Both of these bugs love Rainy weather. With less than 2000 CP, Volbeat and Illumise will not land any spot in the ranks. Their STA and DEF are considerably weak and will not make them last long in raid battles or as gym defenders. Likewise, their ATK is also too weak to make any major damage to almost any opponent. They may have certain advantage over grass and psychic Pokémon, but overall, their stats are too low. Unfortunately, there are no known evolution for either Volbeat or Illumise. So, they are simply just another Pokédex filler. A normal Volbeat has a black colored body. It’s chest and abdomen are blue with yellow stripes. It has red bands that separates its limbs from its body. It also has a red, thick, incomplete band around its neck. 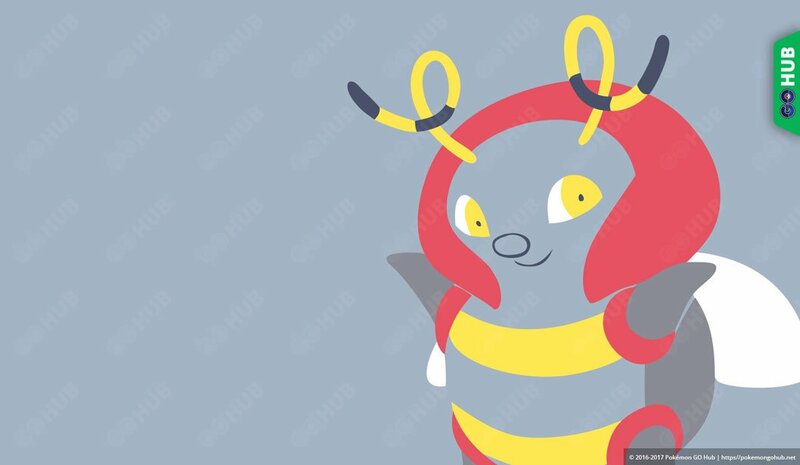 It has a blue colored face, and two yellow and black stripe antennae. It has a spherical yellow tail. A normal Illumise has a black colored body, with a blue belly. It has purple bands that separates its limbs from its body. It has purple curls that surrounds its face, two small yellow antennae and a yellow bow like structure below its neck. It also has three oblong spots on its rear that are yellow in color. A shiny Volbeat has a black colored body. It’s chest and abdomen are light blue with yellow stripes. It has dark blue bands that separates its limbs from its body, and a dark blue, thick, incomplete band around its neck. It also has a light blue colored face. A shiny Illumise has a black colored body, with a blue belly. It has green bands that separates its limbs from its body. It has green curls that surrounds its face, two small gold antennae and a gold bow like structure below its neck. Volbeat made its television debut on the the 12th Pikachu short films titled, “Camp Pikachu”. Illumise made its television debut on the 316rd episode of the Pokémon series (Advanced Generation: Episode 42) titled, “Love at first Flight”.